A place for everything. Wonderfully compelling bookcase doubles as a 6 room doll house. 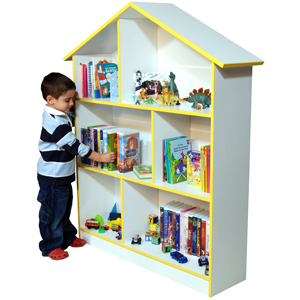 Provides a cozy home for books, toys, dolls and more. Barbie« never had it so good. Shelves are 15 high and will hold the largest books. A great way to encourage imaginative play as well as organize youngsters’ belongings. A place for everything...and everything in it’s place. Right Mom? Matches every dTcor and will be enjoyed by both boys and girls. Item Weight: Approximately 73 lbs.